Mazzella was a Neapolitan writer and historian born around the middle of the 1500s, probably on the island of Procida. He likely died in Naples at the beginning of the 1600s. (As you can tell, we don't know too much about his personal life!) His published works started to appear in the 1580s, and he is still highly regarded for his attention to detail. In that sense, then, it is better to call him a cyclopedist, if by "historian" you mean someone concerned with the social interpretation of human events, how society progresses, etc. That is not Mazzella. His best-known work is Desscrittione del Regno di Napoli (Description of the Kingdom of Naples) (Napoli, G.B. Cappello, 1586, 2nd ed. 1601. Frontispiece, image, right). The book was a monarch's dream—tell me everything about my kingdom! Again, it is not didactic, not philosophy, not Vico or Marx. It is what it claims to be—a description. A good one. Fortunately, he also had a precise interest in the habits, customs and rituals of people he was writing about; thus, the book is not as dry as the title suggests. The "Decription of the Kingdom" is still considered an authoritative source about the first century of the existence of the kingdom of Naples as a Spanish vice-realm, a very turbulent time. The 1500s saw great growth in Naples under viceroy Toledo but also saw great crises in Europe, in general, such as the Battle of Lepanto in 1577 and in Spain, which ruled Naples, such as the loss of the Spanish Armada in 1588. The book was translated into English and provided valuable historical background on Spanish Naples for later English-language descriptions of Masaniello's revolt of 1647 (for ex., James Howell, A history of the late revolutions in the Kingdom of Naples, London 1652). Later Neapolitan historians, as well, have used Mazzella’s work in their own descriptions of Naples in the 1500s. 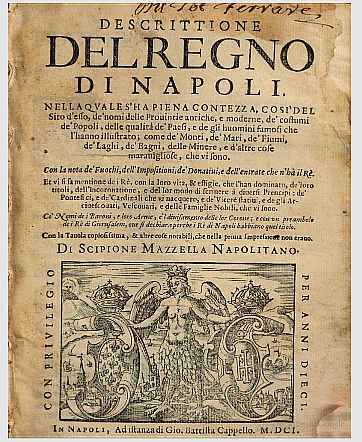 Description of the Kingdom of Naples was published in two volumes. They contain a vast amount of information. There is an overview of the 12 provinces of the kingdom: Terra di Lavoro, Principato Citra, Principato Ultra, Basilicata, Calabria Citra, Calabria Ultra, Terra d’Otranto, Terra di Bari, Abruzzo Citra, Abruzzo Ultra, Contado di Molise and Capitanata, listing major and minor cities and towns, as well as significant castles, forts, towers, casali, masserie (large fortified estates) and other defensive structures. There is also an account of who paid taxes to the crown and how much they paid. The work, indeed, provides a census of the kingdom, the number of households and number of inhabitants broken down into occupation and social class. (The Spanish had brought with them to Naples in the very early 1500s the idea of a new “urban elite," a new wealthy social class distinct from the nobility. Mazzella provides descriptions of important families and persons of this class.) The census also covers the armed forces of the kingdom, how many soldiers and sailors there were and where they were recruited. There is a thorough historical list of the noble classes going back to the first dynasty, the Normans—the sovereigns, princes and dukes. There is also a list of noteworthy geographical features in the kingdom—lakes, rivers, thermal springs, mountains. As well, there are descriptions of local customs throughout the kingdom. Mazzella pays particular attention to religious worship —churches, sacred relics, etc. Mazzella’s other well-known work is entitled Sito et antichità della città di Pozzuoli (Napoli, O. Salviani, 1591) (The Site and Antiquity of Pozzuoli) It is a look at this ancient city, just up the coast from Naples, originally called Dicaearchia ("Just Government") by the founding Greeks in the middle of the sixth century 600 BC. The work went through a second edition in 1606, expanded by the addition of newer maps. The treatment is thorough. Mazzella’s attention to local customs and religious rituals provides us with such gems as the fact that a local peak on the nearby Gauro crater is named Mount of Christ or Mount of the Saviour because of local belief that Lake Averno in Pozzuoli, the traditional descent into Hell in classical mythology was also where Christ, himself, descended into Hell in the three days between His death and resurrection. Gardiner, Patrick. (ed.) Theories of History. Free Press (Macmillan) New York. 1959.
on the website of Napoli Underground at this link.